My dear friend Amanda sent this to me the other day. I feel like it is meant for all of us. 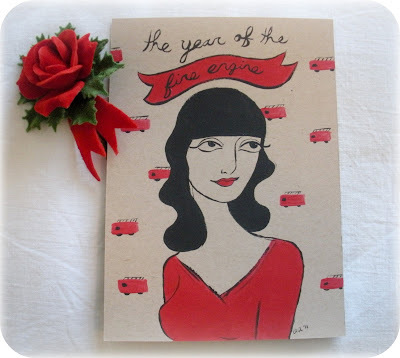 I hope that you too have decided to take this lucky year 2011 on as The Year Of The Fire Engine. I will be giving tips on how to feel like a fire engine all year long. I still remember my Daddy telling me, "Fritzi, you're a fire engine, you just don't know it". I miss my Daddy so much. I want you all to know that I think you all are amazing and beautiful. You are all fire engine's to me. Amanda dear has two amazing giveaways on her blog. The giveaway for her print ends tomorrow so hurry up and put your name in her hat. The other one is for a print from her friend, Ellen's shop featuring Grace Kelly. My friend Micaela is having a virtual date on her blog, inspired by The Year Of The Fire Engine. She is accepting photo's of you all in your favorite shade of red lipstick to feature on her blog next week. Now this is the most important news of all, Alyssa is hosting a swap to fight off the winter time blues. The quickest way to feel like a Fire Engine is to send some love out into the world and make a new friend. Awww, thank you so much, Kat! I so appreciate you mentioning both the giveaways. :) I'm so glad you love the little painting. You are beautiful and I adore you. Oh, I love the painting! It fits perfectly! And I will go take a look at all the great links! That is a fantastic painting! So perfect! so perfect for you, my dear. and now i'm a new follower of amanda, who has amazing work. I love this fire engine idea! I think sometimes we all need a reminder that we are all beautiful & that there is a siren in all of us! =) I'll be watching out for the posts! =) That card is adorable btw! Thanks for the post. I just signed up for the swap!